Shirley was born in 1948. At age five, she was captured from the wilds of Asia and purchased by Dori Miller, owner of Carson and Barnes and Kelly Miller Circuses. In 1958, while the Kelly-Miller circus was traveling through Cuba, Fidel Castro seized power. Shirley and the entire circus was held captive by Castro’s forces for several weeks before finally being released. In 1963, the circus traveled by ship to Nova Scotia and was docked at Yarmouth Harbor when a fire broke out in the engine room. This incident caused the ship to sink, killing two animals. Shirley was rescued, but not before sustaining severe burns on her back and legs. Today she is missing a large section of her right ear as result of the fire and has several scars on her back, side, and feet. At the age of 27, while traveling with the Lewis Brothers Circus, Shirley's right hind leg was broken during an altercation with another elephant. As it healed, several bones in her leg fused together, creating an abnormal angle and shape. After two more years performing in the circus, Shirley was sold to the Louisiana Purchase Gardens and Zoo in Monroe, LA. She was the sole elephant at the zoo for 22 years. For the next seven years, the two elephants were inseparable in a relationship resembling one of a mother and daughter. 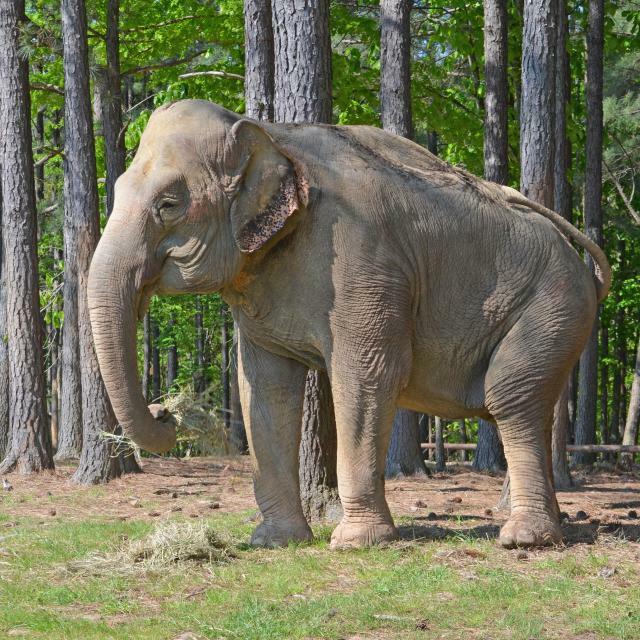 During this time, Shirley also emerged as the matriarch of the “Founding Herd,” a leadership role reserved for the most respected and admired elephant in the group. Jenny died in 2006. After a short time, Shirley was seen spending time with Tarra, and also with Winkie and Sissy. Much like at an assisted living facility, at The Sanctuary, comfort, choice, and independence are tantamount to quality of life. Individualized care from a professional team of Veterinarians and Caregivers has allowed Shirley to age gracefully in a natural habitat setting and make choices about her daily life. 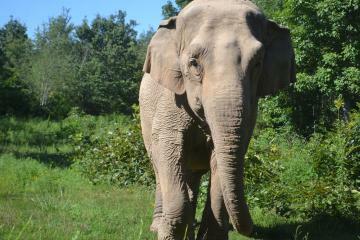 Shirley is the oldest elephant at The Elephant Sanctuary and the third oldest Asian elephant in North America. We have learned so much about elephants aging in captivity through caring for Shirley, and we will continue to apply this knowledge to help care for Shirley and all current and future residents as they age.